In 2016, the National Institute for Occupational Health and Safety (NIOSH) released findings from a study of cancer among U.S. firefighters. The study was the largest ever undertaken, as it included over 30,000 career firefighters who served in cities such as Chicago, Philadelphia, and San Francisco between 1950 and 2010. What NIOSH found is that, not only are firefighters at greater risk for cancer diagnoses (9 percent increase), but that they are also succumbing to cancer-related deaths at a 14 percent higher rate than the U.S. general public. 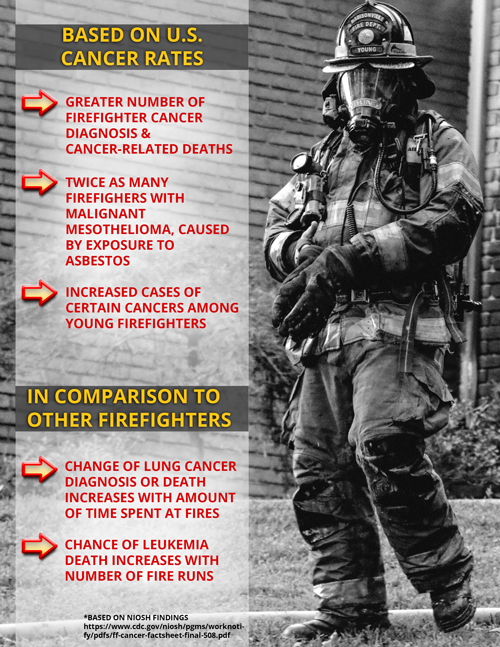 Comparison between firefighters showed that certain cancer rates increased based on factors such as number of fire runs (higher chance of leukemia death) and amount of time spent at fires (higher chance of lung cancer). According to the International Association of Firefighters, cancer has surpassed heart disease as the leading cause of death among firefighters. Between Jan.1, 2002 and March 31, 2017, 61 percent of career firefighter line-of-duty deaths occurred as a result of cancer, compared to 18 percent from heart disease in the same time frame. Furthermore, in 2016, that number rose to 70 percent. Why is that? Why has cancer been so prolific in the firefighting profession over the past two decades? The answer is that firefighters are dealing with far more toxic soot than they were in years past. Thirty years ago, asbestos posed the biggest cancer threat to firefighters. Now, it’s cancers such as myeloma, non-Hodgkin lymphoma and leukemia. That shift isn’t wasn’t by chance. Newer homes and buildings burn down about two-to-three times faster than their predecessors. According to an Underwriters Laboratory study, if a fire occurs in a home, then the inhabitants have less than three minutes to safety escape, compared to about 17 minutes 30 years ago. Fires are burning hotter and faster due to the use of synthetic furniture and building materials, and they’re also releasing more toxic gases than natural materials. Old style, legacy furnishings, such as unfinished hardwood, demonstrate a higher tolerance to flames. Modern furnishings, such as engineered wood and polyester curtains, not only ignite quickly and more violently, but they also leave behind carcinogenic soot from materials like polyurethane and plastic. That soot sticks to the firefighters’ uniforms, which is then transferred to their skin during the removal process. Those non-natural pollutants also become breathable as smoke, so if a respirator isn’t cleaned and checked for a tight seal frequently, then toxic exposure risk becomes far greater. Fire departments aren’t made of money. In fact, all too many are very limited on the funds necessary to replace equipment consistently. In those cases, it’s likely that they can only afford one set of turnout gear for each firefighter. It’s also quite possible that the gear isn’t washed after each use, which can prove to be very dangerous for the wearers. 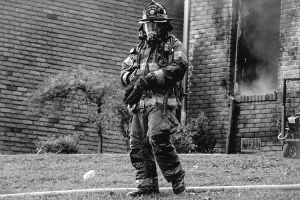 It used to be, and in some cases still is, that soot-covered gear and helmets showed true grit in firefighters. However, there is a stark difference between courageous and foolish. That dirt and those smudges are actually harboring deadly toxins and carcinogens, which can become extremely dangerous once in contact with skin. With the increase in firefighter cancer, OSHA has been fining departments as much as $1,000 per infraction for improper use and handling of turnout gear. Now, many departments are investing in better cleaning equipment and putting officers in charge of creating maintenance plans as means to protect their firefighters. Another way departments have responded to firefighter health risks is by using air tanks that provide 45 minutes of oxygen, instead of the standard 30 minutes. Though, the added time will only be beneficial if the wearers are medically able to wear respirators, and it those respirators fit properly. According to OSHA’s respiratory standard — Standard 29 CFR 1910.134 — anyone required to wear a tight-fitting respirator for work must complete an initial respirator medical questionnaire, and his/her respirator must be fit-tested annually. Cardiac events occur frequently with firefighters, thus medical clearance is vital. And, if the seal is broken in any fashion on a respirator, then the toxic smoke can and will find a way into the mask. In 2005, Los Angeles County Firefighter Paramedic Michael Dubron, a survivor of stage IV colon cancer, formed the Firefighter Cancer Support Network to provide assistance and mentoring to thousands of cancer-stricken firefighters, as well as their families. The non-profit organization also offers cancer awareness and prevention training throughout the U.S. After being given 1-3 years to survive, Dubron made a miraculous recovery, and made it his mission to help other firefighters seek assistance through networking and resources. During a 2017 interview with FireHero.org, he explained that he sought guidance from other cancer survivors during his 9-month recovery, thus creating a survivors’ network. In order to provide departments with the opportunity to become more proactive in reducing health risks, such as cancer, the National Firefighter Protection Agency (NFPA) created NFPA 1582. The standard outlines an occupational medical program developed to reduce risks and provide for the health, safety, and effectiveness of firefighters operating to protect civilian life and property. A key component to NFPA 1582, which focuses on physical ability and overall health, is annual cancer screening – see full checklist here. With a full network of support, a library of resources, clean, tight-fitting equipment, and a comprehensive medical plan, today’s firefighters can be more mindful of cancer without losing ambition for the job they love. Thirty years ago, cancer was the least of their worries. It’s time to make that the case again.